2 June 2015, at 12:00a.m. Premium markets are available for partridges, and this article from Penn State University outlines the steps you need to take to get into partridge production, and examples of the costs involved. Partridge producers typically raise one of two distinct species, the chukar or the Hungarian partridge. Chukars are generally purchased as day-old chicks, while Hungarians can only be purchased as eggs or mature birds. Major differences in husbandry methods between Hungarian and chukar partridges result in differences in the cost of eggs or chicks. Because of the difficulty in raising Hungarian partridges and the strong market demand for them, a premium price exists for these birds. 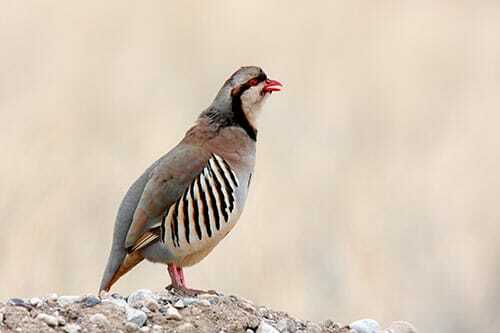 Chukar partridges originated in Europe and Asia and were brought to this country as early as 1932. The red-legged partridge common to most game bird producers is most likely a cross among several different species that have been imported to the United States. The chukar is often referred to as the Barbary chukar, chuk, Indian chukar, red-leg, and rock partridge. The chukar can be identified by a black band running across the forehead, through the eyes, and down the neck. The lower breast and back are generally an ashy-gray color. The bill, legs, and feet of the adult are orange red. Chukars are docile and easily raised in captivity. 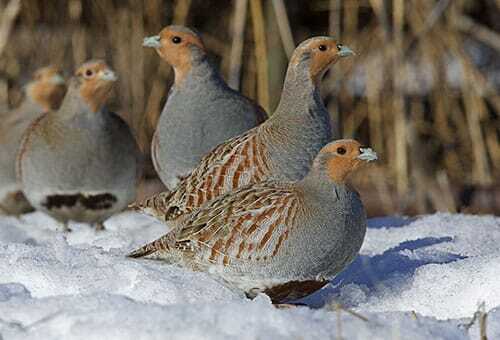 Although most chukars are released on hunting preserves, production for the restaurant market is growing. Hungarian partridges (also known as the gray or hun partridge) were first imported to the United States from Hungary in 1908. They are somewhat small in size, averaging 12-14 inches in length, with mature birds weighing approximately one pound. They have short, round wings and a short, dark, chestnut-brown tail. The body feathers are brown and gray, and the male's flanks are barred in chestnut and white, and the gray breast has a distinctive horseshoe-shaped brown patch on the lower portion. Their eggs are olive colored and hatch in 25 days. As with any business, potential partridge producers need to research markets before starting an enterprise. There are four major markets for partridges: hunting preserves, gourmet food markets (mostly restaurants), individuals who buy live birds for custom slaughter, and individuals who want to restock birds in the wild. There are approximately 20 commercially operated and 200 privately operated hunting preserves in Pennsylvania. Their names and addresses are available from the Pennsylvania Game Commission. Because very little information exists about other markets, tapping into them will require time, research, and development. A practical way to get started is to begin with a flock of 1,000 partridges and use existing facilities when feasible. A production unit of this size allows you to learn necessary production and marketing skills without a large investment. Costs for starting a partridge venture are limited to a brooder house, water troughs, feeders, a heat source, and a flight pen. Start with either eggs or day-old chicks from reputable dealers. Before obtaining eggs or stock, make sure the breeders were free of Salmonella pullorum, Salmonella typhoid, and Mycoplasma. Information about dealers can be obtained from the Pennsylvania Game Commission or Penn State's Department of Poultry Science. If you purchase eggs, they must be kept in a clean environment at an ambient temperature between 55° to 68°F before setting. Although partridge eggs have the unique ability to withstand long storage times and can be held for approximately three weeks before hatchability is decreased, setting them within one week after they were laid is best. When storing for extended times, eggs should be turned once per day. If you purchase or build an incubator, it should be well ventilated, constructed to facilitate turning of eggs, made of a good insulating material, and easy to clean and disinfect. It should be able to maintain a temperature within 0.25°F and supply 60 percent relative humidity. Set clean eggs at 99.5 to 100°F for 23 to 25 days. Many producers mark small groups of eggs on one side to tell when they have been turned. Larger numbers of eggs will require an automatic or manual turner. After the hatch is complete, remove the chicks and hatch residue and thoroughly clean and disinfect the incubator. The first two weeks are critical in ensuring that chicks get a good start, so advance planning is very important. Place the chicks into a warm environment that has feed and water readily available. Make sure all water troughs, feeders, and heat sources are working before the chicks hatch. Because chicks cannot regulate their body temperature for the first 10 days, a properly managed heat source, such as electrical lights, heat lamps, or propane or kerosene heaters, is necessary. Select the most efficient heat source for your housing situation. Set the room temperature at approximately 88°F with a temperature of around 95°F right under the heat source. Observe the bird's behaviour carefully. Increase the temperature if the birds are huddling and decrease the temperature if they seem to be driven away from the heat source. Gradually decrease the room temperature each day (5 to 7°F per week) until it reaches 70°F. Producers can effectively brood partridges in colony cages but must be careful not to leave them in the cages too long because it can affect the quality of the feathering. Maintain a cage density of about four birds per square foot for the first week and then decrease it to three birds per square foot for two- to six-week-old birds. Round all corners of the initial brooding area with cardboard or wire to prevent birds from smothering each other. Chicks are very active and tend to crowd on top of one another when scared, which can result in bird loss. Rounding the corners eliminates a place for the birds to crowd. The way birds are reared depends on which marketing options a producer chooses: hunting preserves, meat-type birds, or egg production. Hunting preserves want a smaller, fast-flying partridge, so move young chicks into flight pens that provide a density of only two birds per square foot. To shelter the birds from humans and protect them from predators, plant vegetation inside the pens, cover the tops with mesh, and bury chicken wire along the base of the sides. Most hunting preserves prefer to purchase birds that are 15 to 16 weeks old. Because of the industry's limited size, few medications have been approved for use in partridge production. Biosecurity and sanitation are necessary to prevent the outbreak of disease. Biosecurity involves separating groups of birds by age, restricting human access to buildings, keeping buildings clean, and properly disposing of dead birds. Isolate all birds entering the flock for one month before contact with other birds to prevent the introduction of disease organisms. This publication includes two sample budgets that summerise costs and returns. The first budget summerises the costs and returns of purchasing 1,000 chukar partridges and selling them at 20 weeks of age. The second budget summerises the cost and returns of purchasing 1,000 Hungarian partridge eggs, hatching them, and selling them at 20 weeks of age. Both budgets include the cost of purchasing the necessary equipment and investing in a flight pen and assume the producer will use existing buildings. These sample budgets should help ensure that you include all costs and receipts in your calculations. Costs are often difficult to estimate in budget preparation because they are numerous and variable. Think of these budgets as a first approximation, then make appropriate adjustments using the "Your estimate" column to reflect your specific situation. More information on the use of livestock budgets can be found in Agricultural Alternatives: Enterprise Budget Analysis. Prepared by R. Michael Hulet, associate professor of poultry science; Lynn F. Kime, extension associate; and Jayson K. Harper, professor of agricultural economics. This publication was developed by the Small-scale and Part-time Farming Project at Penn State, with support from the US Department of Agriculture-Extension Service.